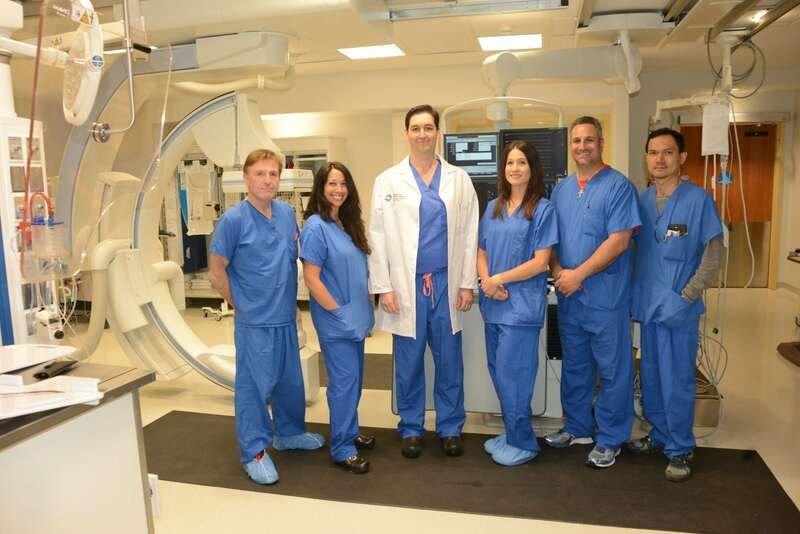 The Heart & Vascular Hospital at Hackensack Meridian Health Hackensack University Medical Center is among the first in the country to perform lower extremity angiograms from a radial approach versus utilizing the femoral artery. Angiograms are performed to check for blocked or narrowed blood vessels in the heart. The radial approach is a safer technique for treatment of peripheral arterial disease (PAD), which is a disease that causes hardening of the arteries of the legs. The disease affects approximately 8.5 million adults in the United States and may cause severe leg cramps. In severe cases, it can lead to amputation. On June 4, two patients with peripheral arterial disease underwent lower extremity angiograms utilizing the radial approach. For patients who have developed significant compromise in their circulation from PAD, a lower extremity angiogram is a minimally invasive procedure that allows treatment of the lower extremity arteries using endovascular techniques. Angiograms are usually performed in a cardiac catheterization lab under local anesthesia using percutaneous placement of a sheath into an artery, which avoids the need for an incision. Typically, the femoral artery in the groin has been used as the site of catheterization, which although is safe in more than 98 percent of cases, it necessitates the patient to lie flat for four to six hours in the hospital after the procedure. Complications, although uncommon, can include hematoma formation or pain in the groin. The Heart & Vascular Hospital at Hackensack University Medical Center is a state-of-the-art “hospital within a hospital.” This facility houses the latest equipment and programs, and integrates preventive, diagnostic and treatment services, with a special focus on cardiovascular disease management and breakthrough research. Inpatients and outpatients are treated for all types of cardiac and vascular diseases, including heart problems, such as blocked arteries and irregular heartbeats, peripheral vascular disease and neurovascular diseases, such as stroke and aneurysm. Hackensack Meridian Health Hackensack University Medical Center, a 781-bed nonprofit teaching and research hospital located in Bergen County, NJ, is the largest provider of inpatient and outpatient services in the state. Founded in 1888 as the county’s first hospital, it is now part of one of the largest networks in the state comprised of 33,000 team members and more than 6,500 physicians. Hackensack University Medical Center was listed as the number one hospital in New Jersey in U.S. News & World Report’s 2017-18 Best Hospital rankings – maintaining its place atop the NJ rankings since the rating system was introduced. It was also named one of the top four New York Metro Area hospitals. Hackensack University Medical Center is one of only five major academic medical centers in the nation to receive Healthgrades America’s 50 Best Hospitals Award for five or more years in a row. Becker’s Hospital Review recognized Hackensack University Medical Center as one of the 100 Great Hospitals in America 2018. The medical center is one of the top 25 green hospitals in the country according to Practice Greenhealth, and received 25 Gold Seals of Approval™ by The Joint Commission – more than any other hospital in the country. It was the first hospital in New Jersey and second in the nation to become a Magnet® recognized hospital for nursing excellence; receiving its fifth consecutive designation in 2014. Hackensack University Medical Center has created an entire campus of award-winning care, including: the John Theurer Cancer Center; the Heart & Vascular Hospital; and the Sarkis and Siran Gabrellian Women’s and Children’s Pavilion, which houses the Joseph M. Sanzari Children’s Hospital and Donna A. Sanzari Women’s Hospital, which was designed with The Deirdre Imus Environmental Health Center and listed on the Green Guide’s list of Top 10 Green Hospitals in the U.S. Hackensack University Medical Center is the Hometown Hospital of the New York Giants and the New York Red Bulls and is Official Medical Services Provider to The Northern Trust PGA Golf Tournament. It remains committed to its community through fundraising and community events especially the Tackle Kids Cancer Campaign providing much needed research at the Children’s Cancer Institute housed at the Joseph M. Sanzari Children’s Hospital. To learn more, visit www.HackensackUMC.org. Bergen Surgical Specialists is a team of some of the best vascular surgeons in Hackensack, New Jersey. We are dedicated to proving each patient with the best possible individualized cardiovascular care. Bergen Surgical Specialists is a team of some of the best vascular surgeons in Hackensack, New Jersey. We are dedicated to proving each patient with the best possible individualized vascular care. The medical team is made up of surgeons with different areas of specialty who work together for more comprehensive healthcare for those needing treatment for heart or vascular disease.